Just 4 bass was working for Capt Mike Shellen today. We had SW winds at 5mph and the water temp was 80. 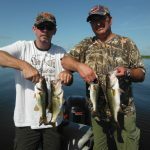 We fished for 4 hours with Phillip and Steven Ezzell and Kevin Hesselgrave. For me right now it is so important to be on your spot when the sun is coming up, you can have some awesome action and it is a beautiful site. Here is a picture of the day.